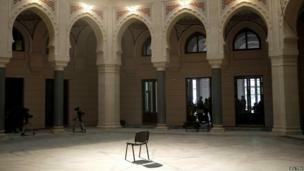 Images from the re-opening of Sarajevo's renovated city hall, and from the war that destroyed the iconic structure. 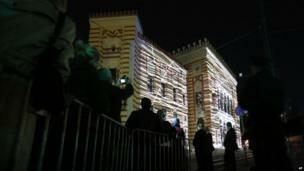 Sarajevo's iconic city hall has been fully renovated and re-opened, 22 years after it was destroyed during the Bosnian Serb siege of the city. The building was first opened in 1896. The reconstruction matches the neo-Moorish style of the original, which dates to the era when Bosnia was part of the Austro-Hungarian empire. Some two million books were destroyed when the building was struck by a Bosnian Serb mortar in 1992. 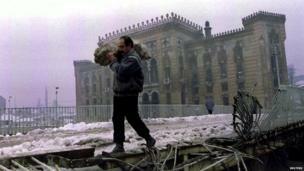 Here, a man carries firewood past the structure in 1994, at the height of a siege that killed thousands of the city's inhabitants. Much of the money for the restoration was provided by the European Union, which Bosnia-Hercegovina is hoping to join. The project has been completed in time for commemorations to mark the centenary of the assassination of Archduke Franz Ferdinand, shot dead as he left the building in 1914. 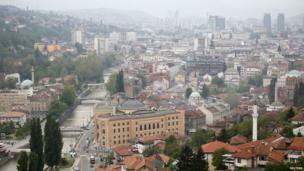 For many citizens, the structure had been a symbol of Sarajevo's rich past. 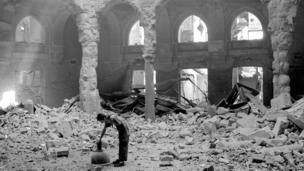 Its destruction was felt as an assault on Bosnia's multi-ethnic identity. As dusk fell over Sarajevo, a light show picked out the new building's facade. Officials say they hope the restoration will heal some of the wounds of war. 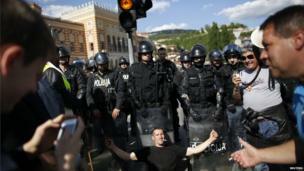 But anti-government protests earlier in the day highlighted the deep frustration many Bosnians feel with the dysfunctional state that has emerged from the conflict.